It looks like everyone is a bit rusty from the FIA World Rally Championship offseason, and a few bruises may result from it. When Volkswagen Motorsport driver and 2015 championship runner-up Jari-Matti Latvala went off course during Stage 11 at the Monte Carlo Rally season opener, he rammed the front of his Polo R right into a photographer. Latvala got back on track soon after, only losing a couple of spots in the running order. The wreck happened during the longest stage of the event, and Latvala started it in second overall. 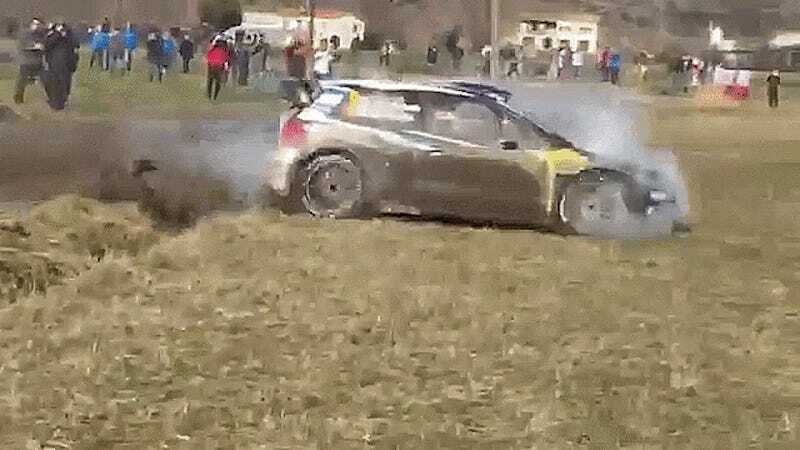 WRC reports that Latvala lost nearly two minutes as a result of damage from running off course, through a ditch and into a spectator, and both Andreas Mikkelsen and Thierry Neuville surpassed him in the overall rankings during the stage. The team tried to make repairs to the broken front-left suspension arm, but the lack of a service facility prior to the final leg means Latvala is out of the rally. Both other Volkswagen Motorsport entries lead the way in the overall rankings after Stage 13, with Mikkelsen just behind defending champion Sébastien Ogier. There are no official reports regarding whether the photographer sustained injury, and the WRC stage summary doesn’t mention the fact that Latvala hit a person in his race-ending crash. The hit was at a fairly slow speed, though, and the photographer looks to get to his knees in the background of the video. But there is a lesson to be learned here. No matter how long the offseason, remember to stay on course if that’s where you’re supposed to be. And if a car comes barreling at you, it’s probably time to move.